New Orleans Saints quarterback Drew Brees has been ruled out of Sunday's visit to Carolina with the shoulder injury he picked up in last weekend's loss to the Buccaneers. Brees, 36, was diagnosed with a bruised rotator cuff in his right (throwing) shoulder -- the same shoulder which he injured nearly ten years ago in his last season with the San Diego Chargers. 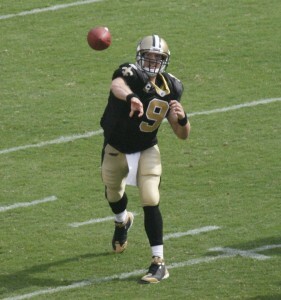 Brees, who visited with orthopedic specialist Dr. James Andres earlier this week, has spent much of this week rehabbing the injury, and tried to throw at Friday morning's practice, but a lack of velocity on the ball made the decision quite easy for New Orleans. "Drew Brees will be out for this game. He'll travel, and I think just where he's at in the rehab and his strength, that he felt, and we all felt like it would be too early for him to play this weekend," Payton said on Friday. "I would say next week we'll continue the process, and without trying to make an estimation about his return, we felt like he made progress without the week, and yet he's not where he needs to be or where we feel comfortable with the strength that he needs. But he did get better each day and we'll just see where he's at next week." Brees, who has not missed a game due to injury since the 2003 season in San Diego, has only missed one start with the Saints: the final game of the 2009 season where he was rested for the season finale ahead of the team's Super Bowl run. Mark Brunell took the reigns that day, and now, the team will turn to veteran journeyman Luke McCown. The 34-year-old McCown, who has not started a game since the 2011 season while in Jacksonville, will look to lead the Saints to their first win of the season after the team has stumbled to an uninspiring 0-2 start. Rookie Garrett Grayson will back up McCown on Sunday. New Orleans will likely lean heavily on the run game, with Mark Ingram and Khiry Robinson certain to see a big workload. C.J. Spiller should be available for more snaps after making his season debut in week 2. Drew Brees will miss the Saints' week 3 matchup with Carolina. "He practiced both yesterday and the day before, and yet this morning, I think he just felt like the velocity still wasn't there," Payton said of his starter. "(McCown) said something earlier in the week, which was true. One of the challenges of being in that position as the No. 2 quarterback is that you might go two and a half years of preparing every week like you're getting ready to play, and then all of a sudden here it comes. So there's a mental challenge to that and a mental discipline which i think is a strength of his." Brees is just the latest casualty for the Saints, who have been beset by injuries dating back to the offseason program. Much like last season, which ended in disappointing fashion, the Saints entered 2015 with lofty goals and expectations, but their slow start has brought the team's future outlook to the forefront. With lingering salary cap issues, an aging roster, continued defensive issues, and reported front office friction, the Saints were looking to lose themselves in their football and spearhead another playoff run. However, with their franchise quarterback injured and several other question marks hanging over the team, both the short-term and long-term outlooks remain murky at best. A victory over their divisonal foes, Carolina, would do a lot of good in terms of recharging the batteries and refreshing the atmosphere in the team's facility. Still very early in the season, the Saints will have as good a chance as any other team in the always mystifying NFC South once they get healthy, particularly at the quarterback spot. New Orleans will put their fath in McCown's hands as they travel to Charlotte ahead of Sunday's game. It's a well-deserved opportunity for McCown, albeit due to the unfortunate circumstances surrounding Brees' injury. Those Verizon commercials are suddenly all too real. Elsewhere around the league, Bears' wideout Alshon Jeffery has been ruled out for Sunday's game at Seattle, along with QB Jay Cutler. Chris Ivory and Eric Decker will both be game-time decisions for the Jets ahead of their game against the Eagles. Falcons' rookie RB Tevin Coleman (ribs) has been ruled out, and Colts TE Dwayne Allen will sit out his team's week 3 matchup with the Titans. Meanwhile, Eddie Lacy (ankle), Jonathan Stewart (knee) have yet to be ruled out, though both have been limited in practice this week.